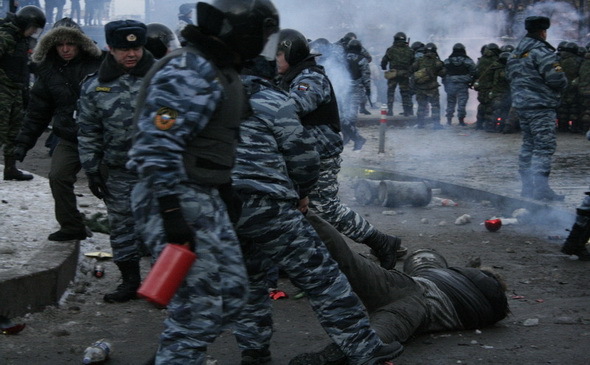 Russian Peoples appalls of Moscow riot. On December 15th, the fans are planning to hold another action in the city, near Kievsky Railway Station. Football fans plan to continue massive actions of protest in connection with the recent death of Spartak fan Yegor Sviridov, who was killed in Moscow by migrants from Russia’s North Caucasus. The fans will continue to gather for meetings until Sviridov’s murder is thoroughly investigated and his murderers are punished accordingly. Many Russian bloggers wrote on their pages that the Caucasian diasporas in Moscow were also planning to hold an action in response on December 15th, in front of one of Moscow’s major shopping malls, near Kievsky Railway Station. Representatives for Caucasian diasporas in Moscow reject the information, though. 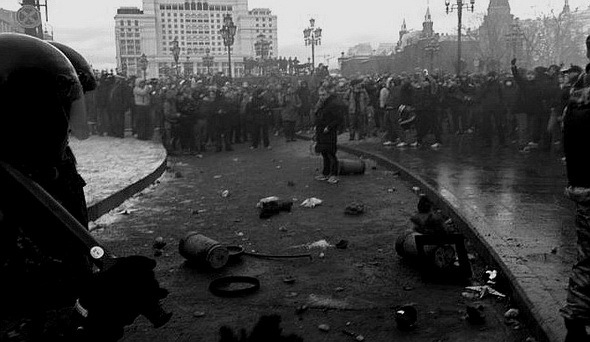 Members of Spartak fan groups stated that they had nothing to do with the riots on Manezhnaya Square on December 11th. They also said that they were not going to arrange any pogroms in the future either. 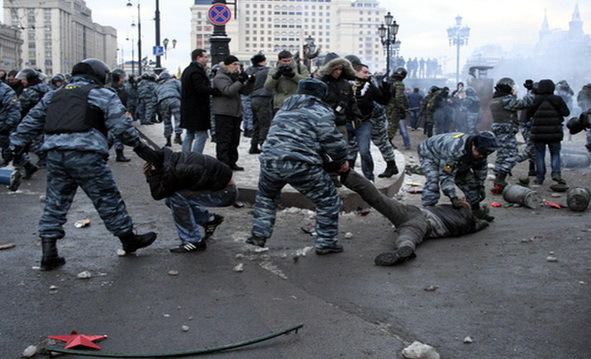 According to the fans, it was not actually the fans, but nationalist groups that gathered on Manezhnaya Square. The nationalists, the fans said, only used the tragedy to achieve their own different goals. On Saturday, several dozens of rioters attacked migrants from the Caucasus on the square and started beating and kicking them. Over a thousand of other aggressive young men appeared on the square soon afterwards, chanting nationalist slogans. On the square, the rioters smashed an artificial Christmas tree. They started throwing Christmas decorations, torches and lumps of ice at police officers. A number of fights between the protesters and the police occurred. The police were forced to use tear gas against the rioters. Also, on Saturday, about 10,000 football fans conducted a march along Kronshtadsky Boulevard, where Yegor Sviridov was murdered. Spartak fans were joined by the fans of other football clubs and “Night Wolves” bikers. The fans and their supporters marched along the boulevard and stopped near the bus stop, where Yegor Sviridov was killed. They arranged their scarves on the stop, laid flowers and lit candles. The fans urged their supporters and followers not to take part in other actions. Nevertheless, about 5,000 aggressive men gathered on Saturday afternoon on Manezhnaya Square, which is located in close vicinity to Red Square and the Kremlin. The people lit fire torches and started chanting nationalist slogans using foul language. Two of the above-mentioned actions were not authorized; their participants did not even try to obtain a permission to hold them. The first action was peaceful, although the second one turned into an aggressive riot with pogroms and clashes with the police. About 65 people were arrested and then released as a result of the riots. Twenty-nine people, including police officers, were hospitalized with serious injuries. The police used batons and tear gas against the rioters. The latter were throwing torches, beer bottles, lumps of ice, garbage cans and Christmas decorations from the crushed tree at the police. The fans were launching signal flares, someone was shooting their traumatic gun. The protesters left the square at about 6 p.m., but the riots continued in the Moscow metro, where the youngest attacked migrants from the Caucasus. Next Next post: Spirit of Christmas Fair.